Weep Vents create weep holes which are required over steel lintels to discharge collected water that may form at the window/door head. Each vent sits in the masonry perp end. They act as a weep to discharge water from DPCs, cavity trays and lintels. 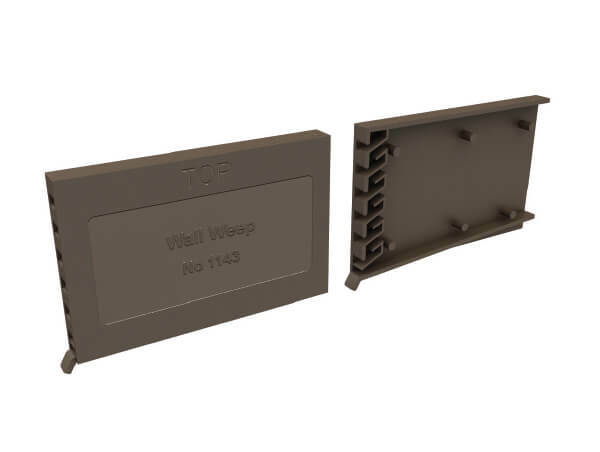 IG Weep-vents also satisfy UK NHBC and Building Regulation requirements. The compact IG Weep-vent can be accommodated within perp joints even when the external skin is constructed of masonry units of minimal height. They are therefore suitable for use within a wider range of walling styles. The IG Weep-vent performs efficiently and its availability in several colours means it merges and harmonises with the masonry in which it is incorporated. IG Weep-vents have full height baffle protected water discharge routes and are not susceptible to blocking. 49mm x 87mm x 9mm. Vents are required at 450mm intervals and each opening should have at least 2 weep holes. BS5628- 3 2005 advises “Proprietary devices may be installed to form weep holes. They may be designed to drain the cavity but prevent the ingress os wind-driven rain. The IG Weep-vent provides all functions and can also be used as a perp ventilator. Vents are required at 450mm intervals and each opening should have at least two weep holes.